Lowering Costs and Improving Care for the Sickest of the Sick Can MCOs Take on This Special Group? Being chronically or acutely ill is a difficult, costly place to be in America’s health care system. Almost two-thirds of all Medicaid spending for services is attributable to the elderly and persons with disabilities, who make up just one-quarter of all Medicaid enrollees according to the Kaiser Family Foundation. 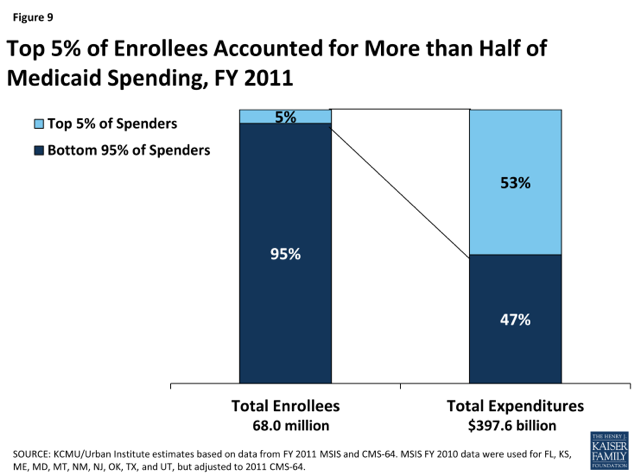 The 5% of Medicaid beneficiaries with the highest costs drive more than half of all Medicaid spending, see their expense chart below. The services these special groups require are vastly expensive and often involve needs for acute care, long-term care support and services, pharmaceuticals and even behavioral health services. Traditionally, these higher need populations have been serviced by states themselves under a fee-for-service model. However the costly economics behind this unique group of people is driving a change. States are turning to Managed Care Organizations (MCOs) for solutions on how to reduce costs. Over the years, MCOs have successfully managed children and families, often considered to be the healthiest of Medicaid populations, within Medicaid at lower costs than states were able to do under the traditional fee-for-service model. MCOs assume the risk from states by managing these healthier members at a set monthly premium per individual. The healthier populations are one thing but can MCOs take on the sickest of the sick – a high-cost, high-need population of members – and service them just as well if not better than their healthier counterparts? Many health care professionals don’t think MCOs are positioned to do it. Commonwealth Care Alliance CEO Bob Master, who served as Massachusetts Medicaid director, is one of them. He writes in Governing, “These individuals need entirely new models and locations of primary care to achieve the desired care improvement and cost reduction goals. Efforts to push these most vulnerable beneficiaries into vanilla mainstream MCO networks, will be at great peril -- mostly theirs!” He believes that traditional primary care scenarios will not work for this group. Their care is complicated and requires a lot of care coordination and time per individual that most primary care networks aren’t set up to handle. Couple that with the fact that doctors don’t recognize MCOs as leaders in facilitating new coordinated care scenarios (see our earlier blog on Medicaid Managed Care vs Fee for Service) and there is due cause for concern that they may not be able to formulate the new integrated care models predicted to work best for this special group. MCOs have also been criticized for not having the local ties to be able to coordinate high levels of care within communities. MCOs already have some experience with costly aging care. The Agency for Healthcare Research and Quality notes that just over half the states already contract with MCOs to provide long-term services and supports (LTSS) for older adults and people with disabilities. They also report that many of these programs create financial incentives for MCOs to keep individuals in their own homes and communities rather than in more expensive institutional settings such as nursing homes. So with this experience base, MCOs can turn to their strength in building more robust community networks for better coordinated care services. MCOs’ strength is in building networks and managing service providers. The National Association of Area Agencies on Aging suggests that MCOs could turn to Area Agencies on Aging (AAA) throughout the country to help them deliver in-home and community-based services. The AAA has already built such networks in local communities. A package of home care services such as daily nurse visits, medical equipment maintenance, meals, help with diet and transportation could greatly improve the quality of life for a senior with lung disease and could help her avoid a health crisis down the road. People ultimately would prefer to stay at home if they can. States are looking to sustain health care costs, but they are also looking to improve quality and accessibility of services. The National Council on Disability (NCD) states it recognizes that managed care techniques can create a pathway toward higher-quality services and more predictable costs, but only if service delivery policies are well designed and effectively implemented. If MCOs are going to take on higher need populations, even the rollout has to be re-thought and adjusted to handle a special needs group. The cost of care has to decrease for states to be interested in managed care for the elderly and disabled, but it can’t be at the cost of quality of care and it can’t put the MCO out of business either. Therefore, MCOs are tasked with building entirely different care networks and models than what they traditionally have provided. Just transitioning this group from a state plan to a MCO is a very complicated endeavor. Without a doubt, MCOs are up for a special challenge if they are going to take this group into their care. If your organization has successfully transitioned a higher need member population to managed care, please let us know. We’d like to highlight your case for others here. California, Louisiana, New Jersey, Illinois, Ohio, Massachusetts and Washington are all in progress or looking at moving the elderly and disabled to MCOs. ←Who Will Fund Coordinated Care Models?